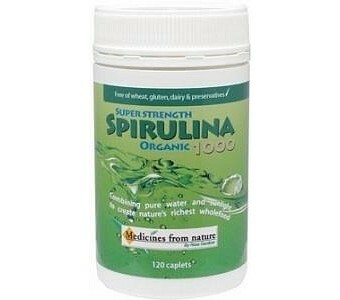 Spirulina is one of mother nature’s most nutrient-dense plant based foods. Medicines from Nature Super Strength Organic Spirulina comprises over 100 naturally occurring essential nutrients and vitamins and over 70% high quality vegetable protein making it a great supplement for vegans and vegetarians. Ross Gardiner Super Strength Organic Spirulina 1000mg is a high quality and high potency Spirulina with the addition of 5mg of silica and 1 mg of magnesium in easily swallowed and digestible capsules. Just three capsules a day provides a valuable maintenance serving which can be increased to suit individual needs if required.